I stuck to the plan for the month of June. So far so good. 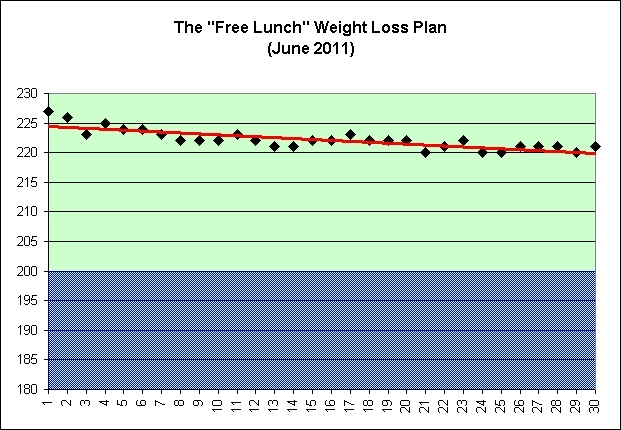 I think a reduced appetite indirectly explains this far better than the direct effect of increased exercise. 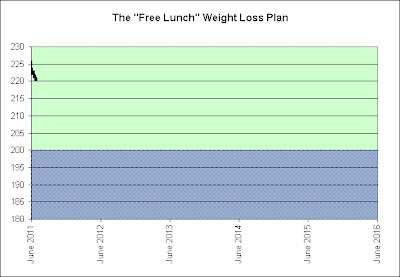 I climbed 600 extra flights of stairs for the month but that should only have burned a pound at most. The 12 ounce glass of water way have been important. I think it displaced some hunger. I'd drink the water just before climbing the stairs. Generally speaking, I was less hungry after I exercised than before it. And lastly, some of this may be seasonal. I tend to weigh more in the winter than I do in the summer. Summer is here. In any event, I'm certainly willing to celebrate. I may actually get to the blue zone ahead of schedule. Happy 4th of July everyone! I'm heading off to see my family and won't be back until the 5th. The cuts represent about four per cent of the company's worldwide workforce of 18,400. A South Korean dog meat festival has been cancelled following protests from animal rights activists. I sure hope there's canned laughter. It can make all the difference. Long-term, I absolutely believe that the Goldilocks combination of strong growth and weak inflation is over. We'll either have less growth, higher inflation, or both. I do not have a good handle on the weighting between growth and inflation though. 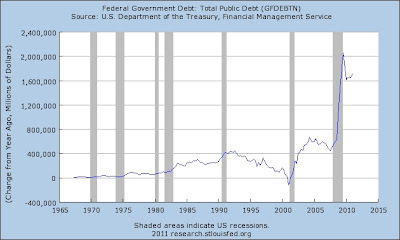 That's why I have owned inflation protected treasuries and I continue to own them. But let me touch upon one other asset class that we feel is very important: inflation-linked bonds. In the U.S., for example, they have the same credit risk as regular U.S. Treasuries, but the interest payments and principal are linked to the rate of inflation. To be sure, there is currently a valuation issue with inflation-linked bonds as real rates on such bonds are low. But we believe those rates are likely to stay low – one way for developed markets to escape from their debt overhang is by artificially keeping real rates low, either through regulation or through higher inflation via inflationary/low-rate policies. So in our view, inflation-linked bonds have the potential to hold their value while serving as a cornerstone of an inflation-hedging strategy. I too believe that real rates will remain low. I've been predicting the death of real yields since starting this blog (and long before it). TIPS are therefore not just my cornerstone. They are nearly my entire stone. I have been investing in TIPS and I-Bonds since 2000. I don't think it will work out as well in the future as it has in the past, but I do think it will continue to protect me. If nothing else, if I hold TIPS until maturity at least I won't require a greater fool at any point in the process. By owning TIPS and I-Bonds, I bet that one of the following five conditions would be met and I continue to bet that way. 1. Moderate growth with high inflation. 2. Low growth with moderate inflation. 3. Zero growth with low inflation. 4. Low negative growth with zero inflation. 5. 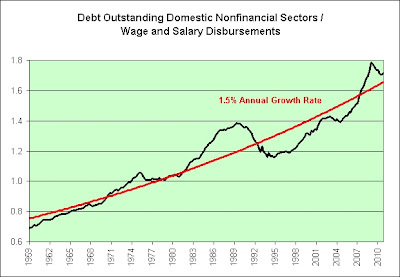 Moderate negative growth with actual deflation. In other words, I don't see TIPS as an inflation bet. I can't predict inflation with any accuracy. It depends on too many factors that are outside of my control. Right or wrong, I did think I could predict inflation rising compared to growth though (either because inflation rises, growth falls, or both). As a side note, I think the Fed is attempting #2 from my list. For the most part, we've averaged #2 over the past decade. We've had low growth with moderate inflation (with episodes of #1 through #5 from the list). That's about the best they can do though. Although some may feel the Fed plays the role of a deity, they can no more create prosperity out of thin air than they can transform dollars (water) into oil (wine). 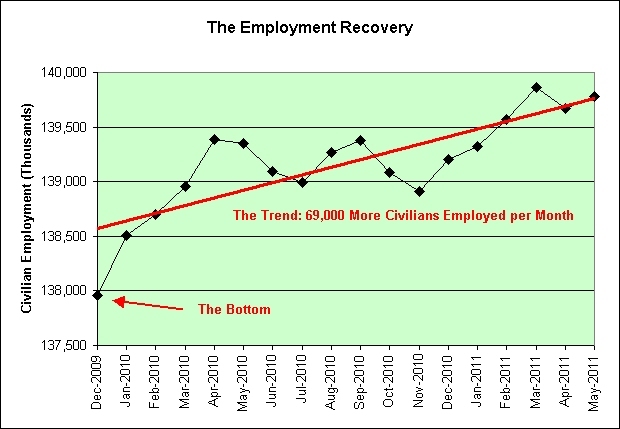 The following chart shows the total nonfarm payrolls divided by the civilian employment. It peaked at 0.97033 in December 1999. Which maestro orchestrated all that prosperity? Such an impeccable finale! Grandioso! Encore! Encore! 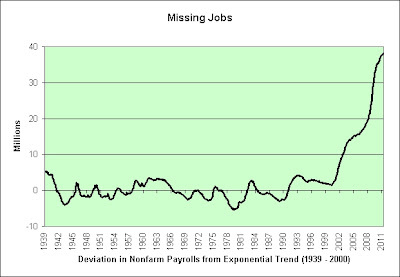 The following chart shows where nonfarm payrolls would be if the employment trend from 1939 to 2000 was still in effect. I've shared this chart in previous posts. The following chart shows how much nonfarm payrolls have deviated from the long-term exponential trend. 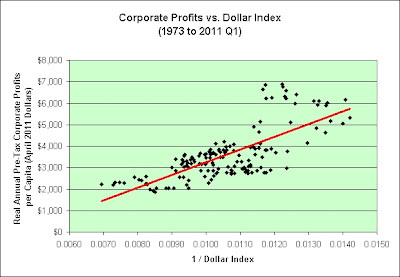 It's just the difference between the current value and the red trend line in the previous chart. 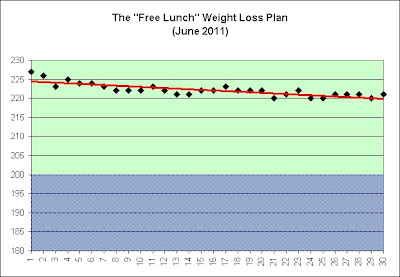 This is not the only chart where this shape appears. 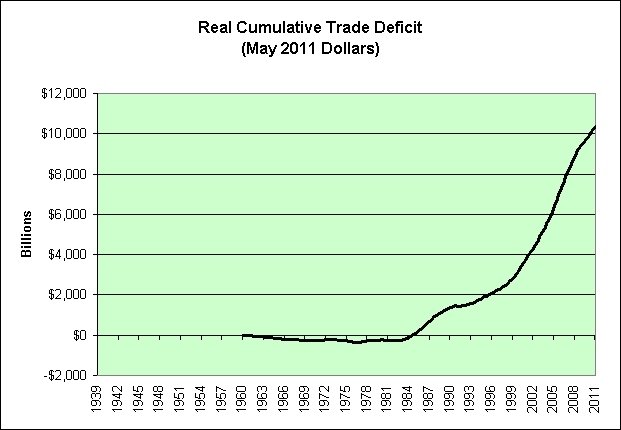 Compare and contrast it to the real cumulative trade deficit. 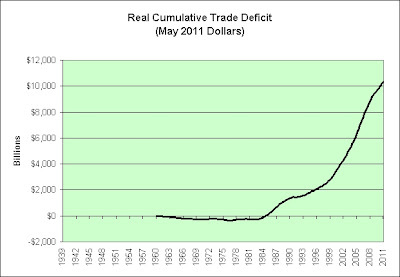 In the following chart I have taken our trade deficit each quarter, adjusted it for inflation, and then added them all up. And now for some sarcasm. It would seem that if we send our jobs overseas then eventually we don't have as many jobs, and without jobs we can't actually afford to buy overpriced homes. How could anyone have possibly predicted this outcome? It's certainly very puzzling. You probably think it is the headline itself. Not exactly. "The people that we deal with a lot on Wall Street are some of the most ethical people I know." - Jamie Dimon, CEO and chairman of JPMorgan Chase & Co.
No! That's not it. You'd think it was it but you'd be wrong. "It's so unfair to talk about Wall Street and ethics." - Jamie Dimon, CEO and chairman of JPMorgan Chase & Co.
Nope. That's not it either. That quote sure seemed like a sure thing though. Right? Unfortunately, there can be only one quote of the day. Sorry. We are in this kind of malaise of some sort. Some of that is understandable. - Jamie Dimon, CEO and chairman of JPMorgan Chase & Co.
We're in a kind of malaise of some sort and some of it is understandable? Here's a chart of just some of the malaise for those who might have missed it. The chart shows where total nonfarm payrolls would be if the employment trend from 1939 to 2000 was still in effect today. 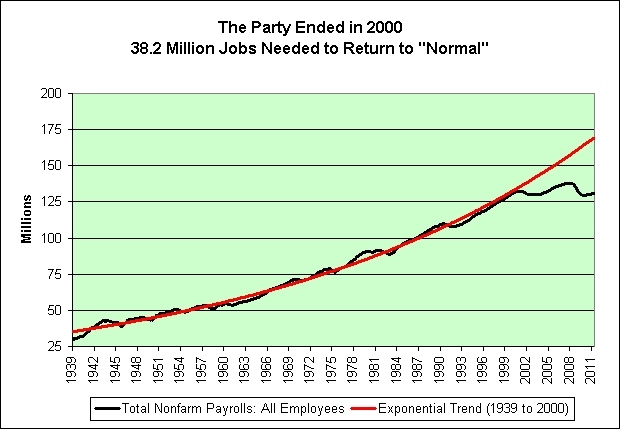 Note that we are now 38.2 million jobs below the trend line. Further, our odds of returning to the trend line at any point in the distant future are worse than a snowball's chance in hell. This might not mean much to the CEO of a large multinational banking corporation, but down here on planet earth we tend to notice the complete and utter failure of a major exponential trend. 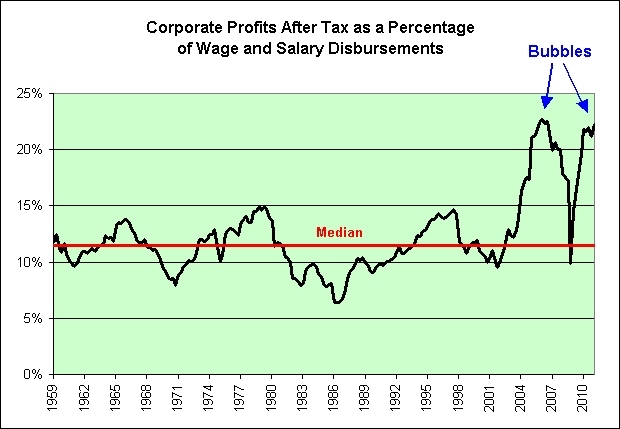 We are especially likely to notice it when our entire economy depends upon it continuing. Ron Meyers, 51, a handyman from Little Rock, Ark., was doubtful that he could afford the drive to visit family in Pennsylvania. Now, thanks to cheaper gas, the trip is on. And he plans on seeing a few more summer movies, too. "You can go out and have a good time, and have a little money left in your pocket," he said. Why do squirrels collect a nut? The reason why squirrels collect a nut is to prepare for winter, when it becomes harder for them to find food! Okay, okay. I might have taken some liberties with that last link. It is possible that I may have altered the words slightly for sarcastic effect. In all seriousness, I have squirrel tendencies. Some might even think I am nuts. So be it! 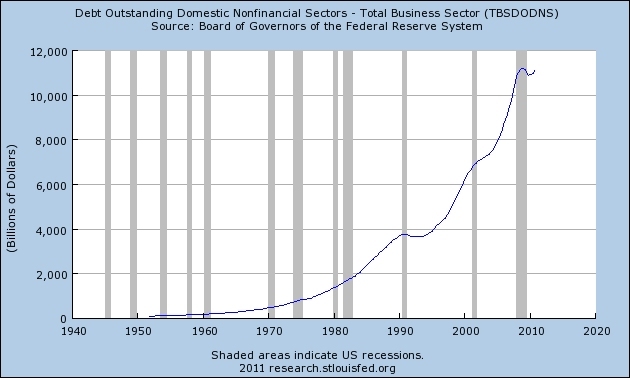 We've done this because, as with any Ponzi scheme, new growth provides the illusion of prosperity. In the near term, revenue grows, while the corresponding maintenance obligations -- which are not counted on the public balance sheet -- are a generation away. You'll definitely enjoy reading this article in its entirety. That's assuming you like reading horror stories that is. $6 billion is all it took to play a game of whack-a-mole with oil speculators. I know what you are thinking. $6 billion sounds like a lot of money. I can't disagree. 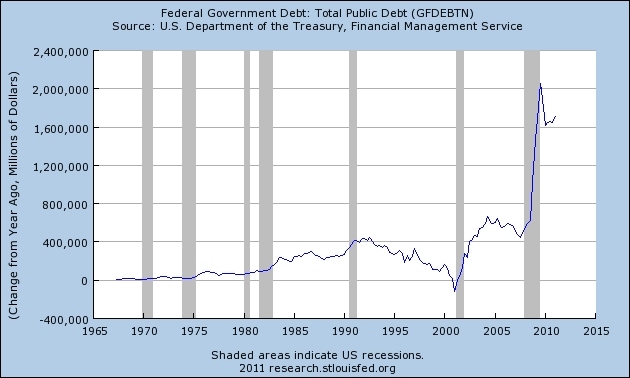 However, we borrow about $1,700 billion per year just to keep the party going. We could lose $6 billion in the couch cushions and not even know it. Just trying to put it in perspective. Technically, Lambert said you can get a ticket for standing in ankle deep water six feet from shore. Guess which county/country I live in. Sigh. A spokesman for the fast-food chain told Nation's Restaurant News: "Parents were generally not choosing Jack in the Box as a dining destination because of a toy." I wonder if the spokesman realizes that the restaurant chain was named after a toy. I wonder if the spokesman realizes that a whopping 19% of the questions in their investor FAQ involve toys. 14. How can I get a Jack in the Box antenna ball? 15. 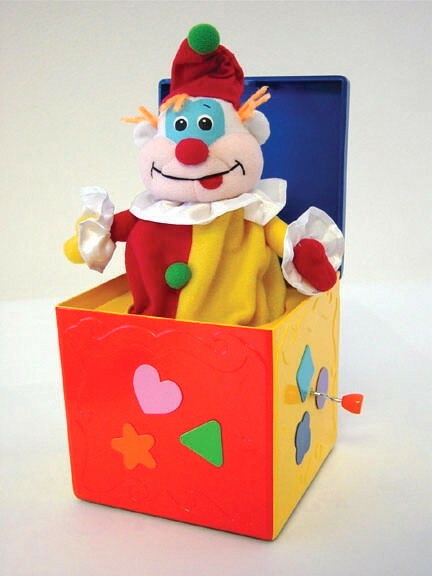 How can I get a kid's premium toy? 16. How many antenna balls has Jack sold or given away? Retail investors are finally provided with the quality investment services of the high-net-worth and affluent investors. Behold the dawn of a new era. No longer must we buy inflation protected treasuries and I-Bonds directly from the government (with no sales charges) and hold them until maturity (with no ongoing annual expenses). There are now suitable alternatives. CHICAGO--(BUSINESS WIRE)-- Nuveen Investments, a leading global provider of investment services to institutions as well as high-net-worth and affluent investors, today announced the availability of the Nuveen Inflation Protected Municipal Bond Fund (NITAX) to retail investors. Credit risk is heightened for the fund because it may invest in below-investment grade quality municipal bonds. The use of derivative instruments involves a high degree of financial risk, including the risk that the loss on a derivative may be greater than the principal amount invested. There can be no assurance that the fund’s inflation-hedging strategy will be successful. In the short term, I think there's a fair chance that the year over year CPI inflation rate may be peaking again. 1. As seen in the chart above, last June was actually deflationary so any inflation at all this June will boost the headline CPI. The year over year rate will be 3.66% plus the seasonally adjusted inflation from May to June. 2. The curve appears to be flattening (and/or rolling over). 3. Housing prices are falling again. 4. Oil is struggling to hold the $100 level. Economic Disconnect has a new look. It can mean only one thing. The Illusion of Prosperity is the blog of broken dreams. 3:24: We respect that investors every day, every second will set the price. 3:30: Well, we respect operating margin and cash flow. 3:50: Again, we respect the need for operating margin and for cash flow. It was a relatively long interview. He said the word "respect" 5 times by my count and I have listed them all. It reminds me a bit of one of my favorite quotes. Similarly, you can tell what a CEO fears most by observing the means he uses to comfort you. This is just an opinion of course, but I think CEO Joe Kennedy fears operating margin and cash flow. Thursday's harsh reversal of fortune left Pandora's stock below its IPO price of $16. The shares fell $4.16, or 24 percent, to close at $13.26. Today, opening Pandora's box means to create evil that cannot be undone. That is probably the single best investment advice I have ever read. Let me summarize 4 of the 7 ways. Limit your options (#1), avoid information (#2), delegate to other people (#6), and trust other people (#7). How can you lose? It is exactly what Bernie Madoff investors did and if memory serves they made out like bandits. Disclaimer: This is a sarcasm report. What's dead fish without a bounce? What's a fool without a seer? Some hope without some fear? "Stocks will never never never come down!" It is FIRE, we are "poned"
We're sold fish head lies! The Anchor River will close to sport fishing beginning on Wednesday, June 15 at 12:01 a.m. through Thursday, June 30 at 11:59 p.m. to protect king salmon returning to the river. "It's sell and ask questions later," said Steven Goldman, chief market strategist at Weeden & Co. in Greenwich, Conn.
Crude oil tumbled below $US95 a barrel for the first time since February on concern that Europe's debt crisis will deepen and on signals the US economy is slowing, reducing fuel consumption. GYSC inspired me to come up with new lyrics for this song. Sing along. You know the words! I received a shady letter in the mail today. The return address is a P.O. Box in Utah and the the following is included just above the name in my mailing address. It goes on to "inform" me that I may be owed a refund of several thousand dollars. Fraudulent foreclosure “rescue” professionals use half-truths and outright lies to sell services that promise relief to homeowners in distress. According to the Federal Trade Commission (FTC), the nation’s consumer protection agency, the latest foreclosure rescue scam to exploit financially strapped homeowners pitches forensic mortgage loan audits. I turned bearish in 2004 based on mortgage offers I was receiving in the mail. Guess what? I'm still bearish. On a brighter note, mortgage audit jobs seem to be picking up and that can only mean one thing about the prospects of economic growth heading forward. Yeah, that's right. It's a Bill Murray two-fer . Woohoo! Sigh. MaxedOutMama exclaims, Mark, your hour has come! So we have rising price trends, poor profit trends (somewhat mitigated by higher prices out of necessity), poor sales trends, and remarkably poor employment trends. 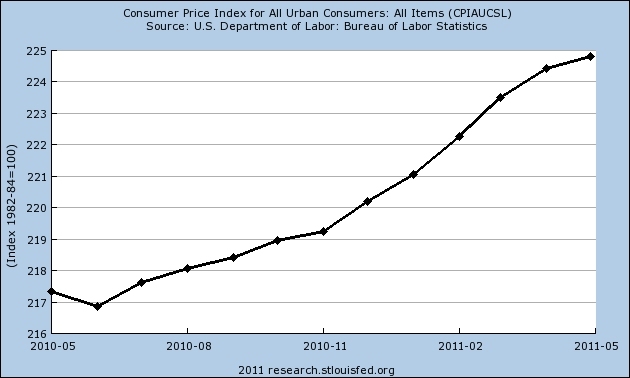 Some may call this stagflation; that is the most positive possible way to describe the situation. Do not ask for whom the bell tolls, it tolls for me. The inflation rise in May was the fastest since July 2008, when the rate was 6.3 per cent, before peaking in February 2008 at 8.7 per cent. The financial crisis led to prices falling, because demand for China’s exports fell sharply. The less prosperous the enterprise, the greater the proportion of available sustenance claimed by the tapeworm. I once again ask the same question I asked in 2007. ...an index of all stocks (A shares and B shares) that are traded at the Shanghai Stock Exchange. The closures were so sudden, some diners were forced to leave while they were still eating. No apple pie for you! One of the first heckles on this blog was aimed at the company where I once worked and at RadioShack. For what it is worth, things went downhill at the company where I once worked when plans were announced that we'd be moving into a new, more luxurious, and much more spacious building. I suspect it is not entirely a coincidence. It was very odd to be talking about the new space one day and see people being laid off the next (many rounds of layoffs followed and a few years after I left the doors were closed entirely). At some point it became a joke. There weren't going to be nearly enough people left to fill the new space. Then there's the RadioShack story. I could not understand why a struggling business (in my opinion) would be building itself a new corporate shrine. "Shrine" is also my opinion. Take a look at the pictures and description. Decide for yourself. It was completed in May, 2005. Have you increased your purchases at their stores since its completion? Do you think that money could have been better spent upgrading the look of their actual retail stores instead? RadioShack's stock price was $23.66 on September 16, 2007. It is now $12.66. That's a 46% loss. This brings me to Apple. The company has asked the city of Cupertino, Calif., for approval to build an office complex that looks like it's ready for outer space. Is building a new corporate "shrine" really the best use of Apple shareholder money? The stock is down 10% from its all time high. Some might call it a bargain. I tend to see things a bit differently. At a market cap of $302 billion and a global population of 6.78 billion, the market thinks Apple is worth roughly $45 for every man, woman, and child on this planet. That said, perhaps Apple isn't actually priced for this planet though. "The Mothership has landed in Cupertino." Perhaps the Mothership has a warp drive. And lastly, here are two observations about the edifice complex from the Urban Dictionary that might amuse you. I think they very much apply here. Its last weekly slump of this length was in October 2002, the start of a five-year bull market for equities. I'm trying to recall October 2002. What did the stock market do heading into it? If it nearly doubled like ours has, then this could definitely be the start of another five-year bull market for equities. It is October 2002 all over again! The similarities are uncanny! 5-year bull market here we come! 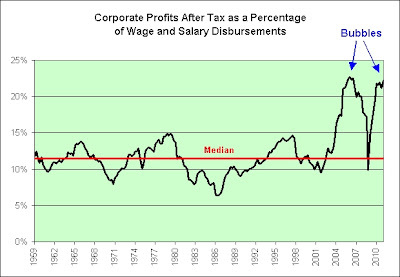 Wisdom Seeker wanted to see corporate profits per employee. Here are my conclusions. Keep in mind that they are opinions. 1. 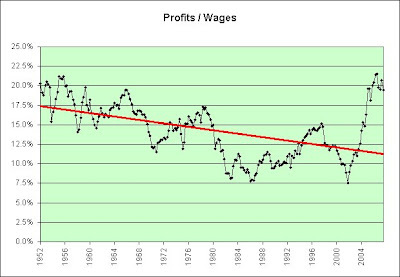 Increased profits due to worker productivity improvements have been offset by reduced profits due to increased global competition. 2. There have been two profit bubbles in the last decade and we're currently in bubble #2. 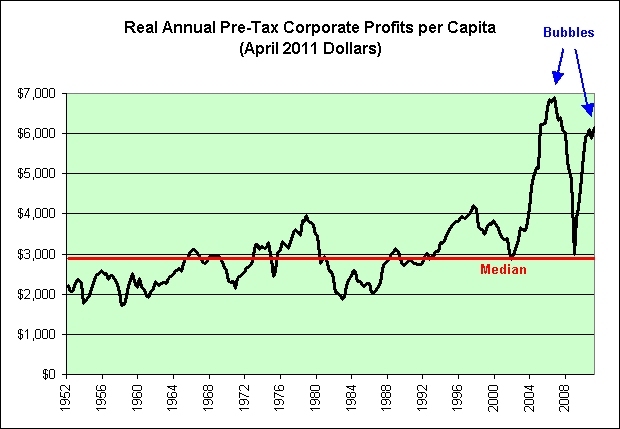 Heaven help this economy if and when corporate profits return to the median (again). 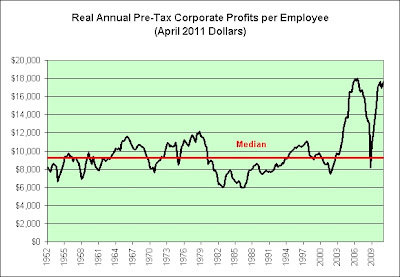 Here's an update of the charts I did previously using "per employee" instead of "per capita". The dollar index relationship still appears to apply. This is a continuation of yesterday's post and is inspired by the comments of Wisdom Seeker and Jazzbumpa. They felt that I should have used an exponential growth curve. I could not see the driver of such a curve since I was already adjusting for population growth and inflation. It then dawned on me. The exponential part comes from our desire to exponentially devalue our way back to prosperity. In the charts that follow, I'm using the dollar vs. other major currencies as seen in the "Trade Weighted Exchange Index: Major Currencies" at the St. Louis Fed. Note that the relationship is on a curve. 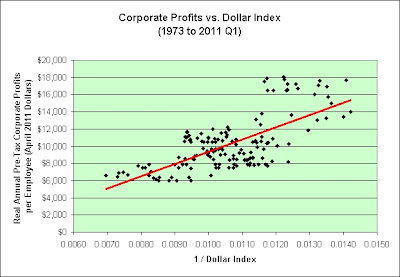 Here's what happens when I use the inverse of the dollar index instead. 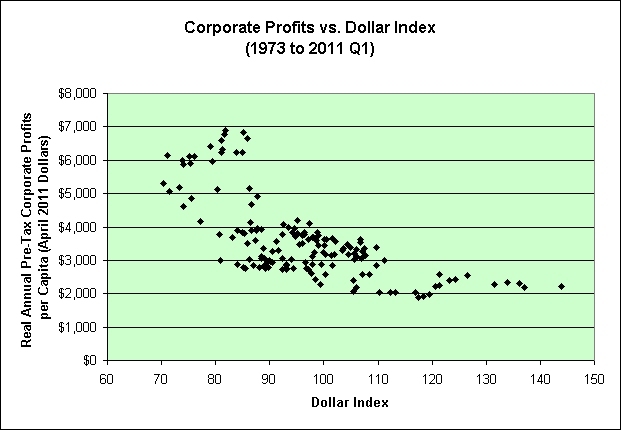 As the value of the dollar relative to other currencies goes down, the real profits per capita go up. This has huge implications. 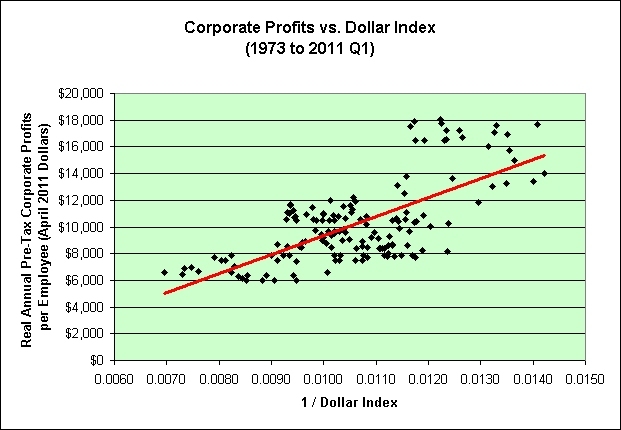 We can have nearly infinite real corporate profits per capita if we can get the dollar's value relative to other currencies to go to nearly zero. There's just one small problem. Oil will be nearly infinitely expensive. Here's some bonus sarcasm. 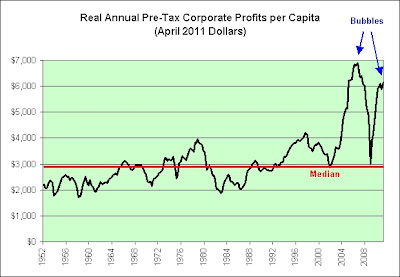 If we can get this dollar index down to 1, then this chart shows we will have $588,000 in real annual pre-tax corporate profits per capita. Other than attempt to buy oil with it, what will we do with all of that prosperity? Here's another way to look at that second chart. 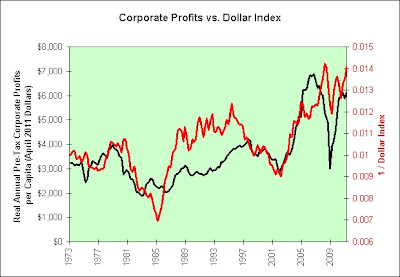 This chart shows corporate profits before tax (as seen on line 12 of table F.7 Distribution of National Income of the Fed's Flow of Funds Accounts report released today) adjusted for both inflation and population. 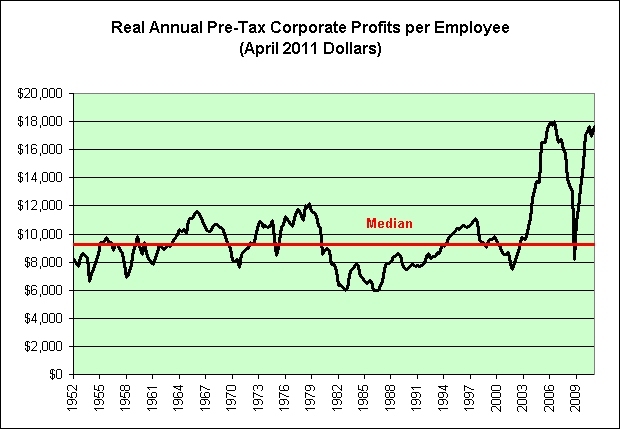 I would argue that these profits are not sustainable long-term. Pacific Investment Management Co. Chief Executive Mohamed El-Erian Thursday said he was worried by recent economic data on both the domestic and global level and doesn't see how corporate profit growth can be sustained within this environment. I don't see how it can be sustained within any environment. At the very least, fat profits such as these inspire more competition (and more competition eventually leads to lower profits). This post has a followup and some of my opinions have been altered. 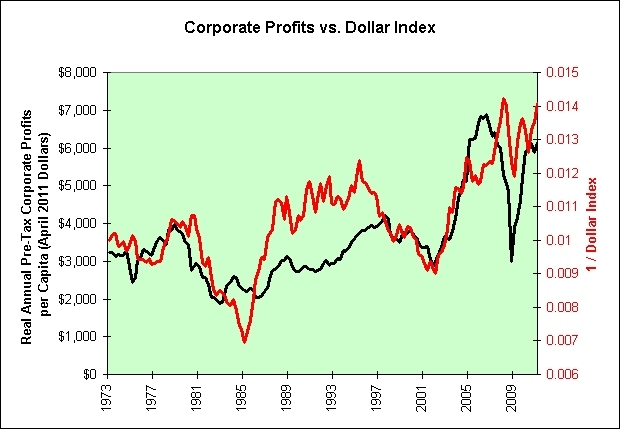 Please see Corporate Profits vs. Dollar Index. GOLD is not the bubble that many fear. This implies a few things. 1. There will be a time when it is too late, just like there was in the late 1970s. They won't ring the bell at the top though. Had I been a gold investor in the late 1970s I would have been fairly convinced that I was doing the right thing. Inflation was out of control. 2. Unlike 5000+ years of history, gold is no longer just an inflation hedge? It now generates profits? This time it is different? 3. "GOLD" is an emotional investment. How else can one explain that each letter in the metal's name is capitalized? For what it is worth, all caps is generally considered to be screaming. "To scream is to utter a loud, piercing cry, especially of pain, fear, anger, or excitement." Note the word "fear" in scream's definition. 4. When I bought gold and silver in 2004 (and later sold in 2006), nobody feared the gold bubble. In fact, the owner of the mint tried to talk me out of buying gold. I kid you not. In hindsight, it was a great time to buy. 5. Nobody fears a toilet paper bubble. You won't "profit from" toilet paper, but it is definitely not too late to buy. I own over an acre of it. No joke. At today's prices (Costco) you too can own an acre of it for roughly 1/5th of an ounce of gold. In all seriousness, which would you prefer to own if the @#$% really does hit the fan? This post is mostly intended for those who would buy gold at these prices without at least considering the purchase of basic necessities first. For gold's current price to make any sense long-term, then toilet paper prices must rise and rise substantially. Of course it is also possible that gold's current price doesn't make any sense long-term. It is well above its long-term inflation adjusted price (just as housing was in its bubble). If that is true, then you'd be far better off hoarding toilet paper (and other basic necessities) than gold right now. As an added bonus, you won't require a greater fool to buy them from you nor will you need to pay any tax on the inflationary gains. You can simply use the products until they are gone. Just opinions of course. I have no idea what people will ultimately pay for gold. I can put a value on toilet paper though, because I know pretty much what it is worth to me. I can say with 100% conviction that I prefer to own an acre of toilet paper than a 0.2 ounce gold coin. What can't go on forever, won't. The Triple-A Rating: Going Extinct? "There are a lot of dead soldiers that are former triple-A rated companies." Gross said a year ago that bonds had very likely seen their best days, and he reiterated that viewpoint in a Bloomberg TV interview a few weeks ago. When asked if investors should buy stocks instead of bonds, Gross said, "I think so." He thinks so? He doesn't seem 100% convinced. Here's my theory for what it is worth. I do think bonds have seen their best days. 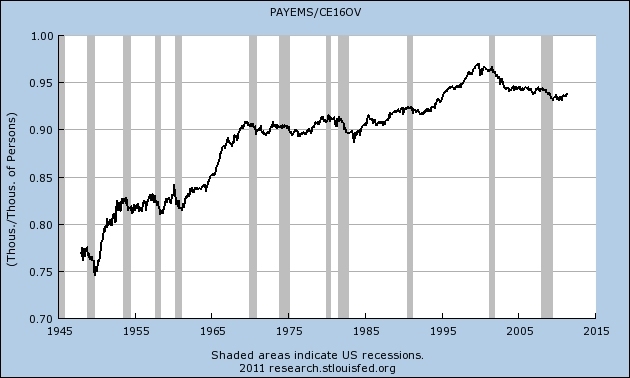 Long-term rates have fallen from about 15% in 1981 to less than 5% now. It would be difficult for them to fall another 10%, especially since 0% is the floor. If he is trying to imply that interest rates will rise and stocks would therefore be a good choice then I might disagree. Stock market investors did not do all that well in the 1970s as interest rates rose. I think it would be even worse today. 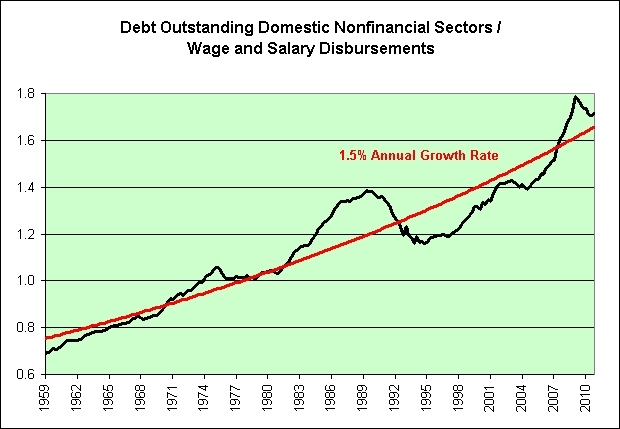 Would stock market investors "appreciate" (pun intended) higher interest payments on $11 trillion in corporate debt? I tend to think not. Of course, there's the other end of the spectrum to consider as well. We could continue to fight deflation. Housing prices do continue to fall. Bond investors could still do okay even at these pathetic rates. Although bond investors have already seen their best days, would stock market investors "appreciate" more deflation and even higher unemployment? I've been giving some thought today about how I have been consistently too optimistic even in my own dire predictions. I therefore offer a risky bet for those who feel that I continue to be too optimistic. This risky bet failed. There is no way to recoup the losses. I did not lose money on this bet (since I am risk averse), but I am still adding a "my personal blunders" tag. Fair is fair. Golden Gate Capital, a San Francisco private equity firm, said Wednesday that it will buy California Pizza Kitchen for $18.50 per share, or $470 million. Although I continue to see ugly revenue and income growth, someone still saw hope there. It certainly wasn't the following person though and I must say that I share the sentiment. Same-store sales were off 2.1%. This is an update to an earlier post and is inspired by the discussion going on over at Retirement Blues in this post. 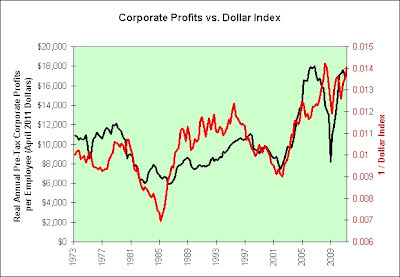 Forgive me for saying so, but isn't economic softness and intensified competition a rather bad combo for continued fat corporate profits? In hindsight, the question I asked in December 2007 (the official start of the recession) had quite the answer. 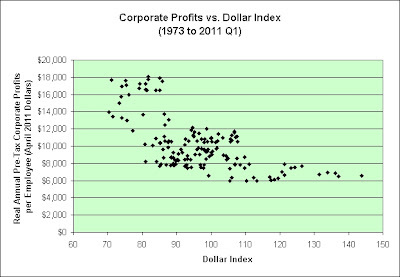 As seen in the following chart, I'm thinking of asking that very same question again. Go figure. 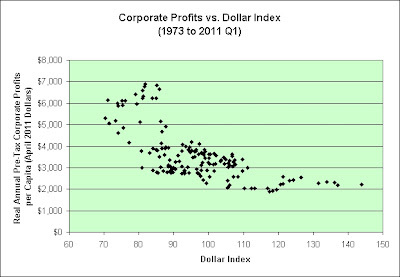 The charts are slightly different because I'm using after tax profits instead of total profits. The conclusion is the same. Danger! In any event, reversion to the median is generally just a matter of time and I see no reason to think why this time would be any different. 1. Don't use real money. You are competing head to head with firms like Goldman Sachs and their "highly-profitable automated trades." If you're impulsive or high-strung, day trading is not for you. But if you can think fast and stay cool, it may be worth a try. Here's what you must know to start. You might also consider becoming a rookie mixed martial arts fighter. It may be worth a try. What's the worst that could happen? The United States has a "Fed that wants a lower dollar" Merk says, offering an opinion that everyone except the Fed accepts as fact. Since everyone already accepts this as fact, then it stands to reason that everyone should already hate the dollar and love the euro by comparison. 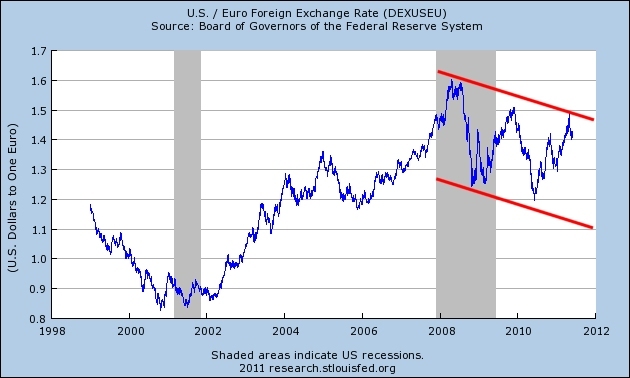 The reason he likes the euro "is because everybody hates it." 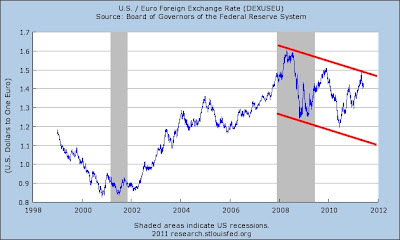 For something so hated the euro sure has gone up in relative value a lot. It also sits near the top of its recent trading range ($1.4624 as of today). I must not understand the meaning of hatred. Optimism? Hatred? It's all good. 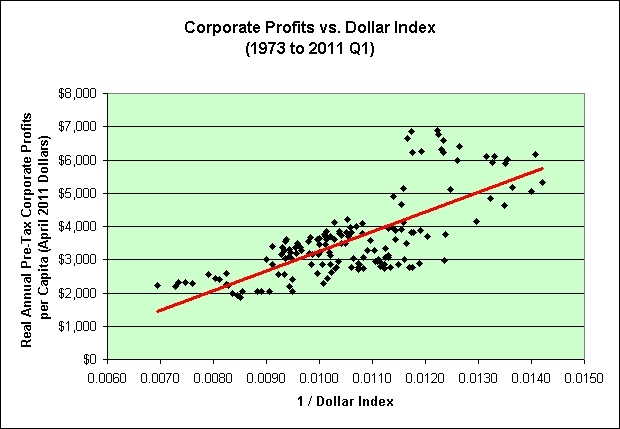 Note that the last two data points sit right on the trend line. “The only sustainable recovery is the kind of recovery that rebalances away from consumer demand and towards external demand,” said one Treasury aide. So here's the plan that might not only save the UK, but the entire global economy as well. We'll set up a new country on the moon. I suggest Moonistan. Right now Moonistan has no ability to create its own products. That means that the entire world can sell to them. Just picture all that external demand! We'll send them goods and they'll send us back Moonbucks. As we begin to accumulate Moonbucks we can simply reinvest them in Moonistan's public debt. It isn't like we'll need to spend them. In theory, we should probably station a guy up on the moon to control the country of Moonistan. In practice, we could probably just station a guy in the Cayman Islands . All that really matters is that someone somewhere accepts the goods and sends us Moonbucks in exchange. I know this can work. It's actually based loosely on the Chinese economic miracle model. What happens to the goods you might ask? Great question. In theory, we should probably ship them up to the moon and store them for the future citizens of Moonistan. In practice, we could probably just dump them right in the ocean off the Cayman Islands. Fifty percent of restaurant operators reported a same-store sales gain between April 2010 and April 2011, down slightly from 52 percent of operators who reported higher same-store sales in March. What did the other fifty percent report? During the real estate boom, a surge in junk mail papered over the unraveling of the postal service's longtime business plan. Banks flooded mailboxes with subprime mortgage offers and credit-card come-ons. 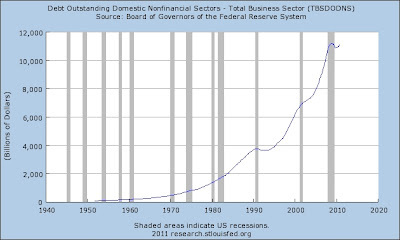 Then came the recession. 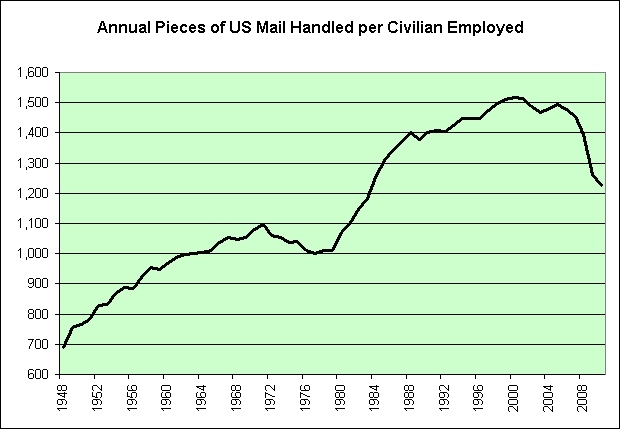 Total mail volume plunged 20 percent from 2006 to 2010. It is exactly what turned me bearish in the first place. No joke. The USPS has 571,566 full-time workers, making it the country's second-largest civilian employer after Wal-Mart Stores (WMT). Just look at those '70s! Okay, maybe it's not just like the 1970s. We do now have computers delivering email faster, cheaper, and more reliably than humans. I'll give you that. 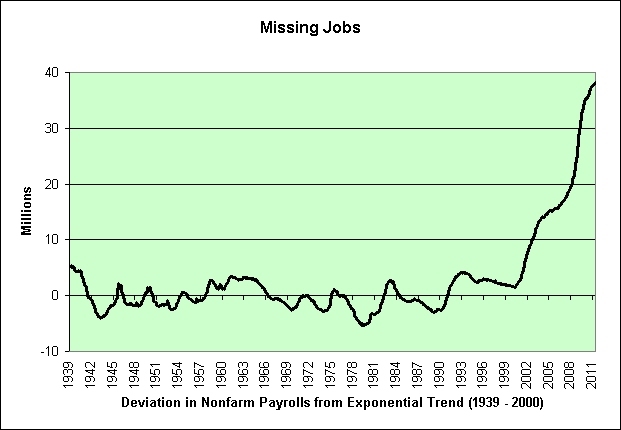 Okay, maybe there was some civilian job growth in the 1970s (there was) that would help explain the drop in the chart. That's not exactly happening now either. Let's look on the bright side though. If we can reduce the number of civilian employed faster than we can decrease the amount of physical mail, then the chart above will start to improve. 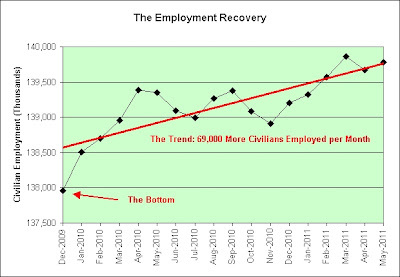 In fact, if we can get civilian employed down to zero and still manage to deliver so much as a single postcard then the chart is heading to infinity! Woohoo! It is a dark, dark day for sarcastic gallows humor. Sigh.